When my family and I first visited our new home back in April, I fell in love with its simplicity and charm. Once we returned home to the house we were leaving, a feeling of dread overwhelmed me. “Where would all of our belongings go?” For the purpose of emotional calm, I began referring to the belongings as “stuff” to help me detach. After a month and a half of packing, which included packing up and moving my husband’s mother to live with her granddaughter, we are finally finished the dreaded move. Sitting 38 miles to the north is the house I moved into August 3, 2008. My husband had already lived there for sixteen years. Now, almost seven years after our wedding day, I am sharing a home I feel is mine and ours. For those of you who have married a divorced or widowed individual, you will understand how I feel. The home I lived in was still the home of the departed spouse. In my case from the garage to the attic and each every room was planned, decorated and furnished by my husband’s late wife. When I moved in, I was truly grateful for her great taste in decorating. Even to this day, I am thankful I did not have to take on that task. Yet as the years moved on, I desired to have my personality represented in the home decor. This move has allowed me to experience that desire once again. Although I am currently up to the rafters in boxes. I am content in knowing, this is the home my husband and I will share for a season. It has become and will continue to be a peaceful sanctuary where we will have an opportunity to grow old(er) together. This house has already given my step-daughter an opportunity to be a part of a family again. It is so small she cannot isolate herself; yet large enough to allow movement between her bedroom, the family room and the outside deck. For the first time, I am experiencing the roles I have always longed for. It has been a long and hard seven years…ten years if you include the years my husband and I dated before we married. I enjoy her quick business mind and the ease she grasps situations. As it is in life, our relationship is a dance; sometimes a two-step, at times the cha-cha, and others the tango. But, rarely the rumba. I’ve learned to gauge her moods and interact accordingly. Very excited! Received the notice from the printers the book layout meets their specifications. I ordered a softcover proof of the book. I see a couple of minor changes. I always like seeing the manuscript in book format before signing off on it. I will be working on the webpage in the meantime. It should be done tomorrow, and you can order the book directly from the site. I have heard there are a number of people anticipating the launch. I am pleased with the response. This is a small project. It is a starting point for these two young ladies’ careers. Hadana is eleven and Joy is sixteen. They will share in the commissions and royalties. There will be an “easy reader” version coming out in the near future. Joy will be out of school and have more time to produce the illustrations during her summer break. I am also going to see if Hadana would like to do a second book. There is nothing like “striking while the iron is hot” when mentoring young folk. Pray for us and pray for our future projects. Mentoring adults also brings me joy. 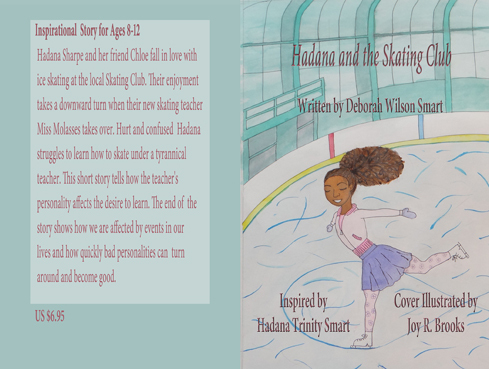 “Hadana and the Skating Club” is personally my second book. I published “Joy Comes Through the Mourning” in 2011. I am putting the finishing touches on P. J. Richardson’s story, “Pearl, The Little Light that Shines” and it will be ready for release within the next few days. P. J. has a blog http://thepearlineoyster.com. Hadana and the Skating Club will begin shipping May 1st. Order your copy today. No matter where you are in your life, believe this one thing; God makes room for your gifts. He also brings people into your life to help you grow your gift. Do not be afraid to step out and follow your dream.